He was not a man of soft tones. 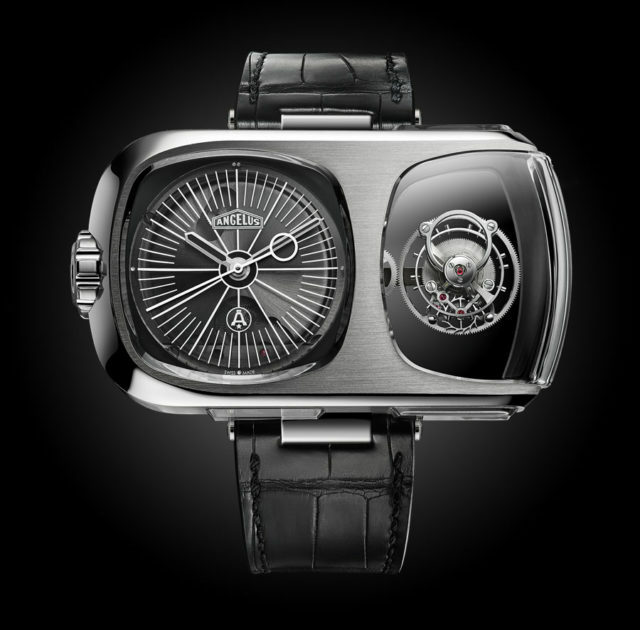 Thus, with his dark, life-drawn voice, he himself was the greatest watchmaker of the last 100 years. For his posterity, George Daniels, the great universal watchmith, who was actually autodidact, will be remembered especially with his invention of co-axial inhibition. Born on 19 August 1926 in poor circumstances, Little George was one of eleven children who saw the light of the world in the suburban Northwest of London. Already at the age of five, he discovered the “center of his personal universe” in a cheap pocket watch, as he once described it himself. Fascinated by the mechanics of the clock, he developed a true passion for the microparticle set of balance, escapement and wheels, and contributed to their interaction in order to earn a first pocket money in the repair of timepieces. He built his first own clock without the necessary equipment in a 2 years lasting “learning by doing” unit, in which so many nights of sleep were deprived. From then on, he dealt with the acquisition of knowledge for the production of as precise watches as possible. George Daniels, who was influenced by an unbridled will, was a thorn in the eye that electricians were trying to convince him that the quartz crisis had begun. He finally came to the conclusion that the strength of a mechanical watch opposite the quartz watch could be a long-term high degree of accuracy of the gear, at the same time low maintenance and without the addition of additional materials. However, there was a problem: the inhibition had to be regularly lubricated to prevent an increasing friction-induced gait. With the invention of co-axial inhibition, there was now virtually no more friction between the armature wheel and the armature. A light, impulsive stroke was enough to allow the gearwheel to engage with the next tooth, making the regular oiling of the most friction-resistant watch component almost entirely obsolete. (In another post, we have already dealt with 6 myths and misconceptions about co-axial inhibition). As early as 1975, Daniels developed the first prototype of a watch, but it took another 20 years until he could convince the Swiss watch industry to make the watch mass. Finally, Omega took up the innovation and since 1999 has been producing watches with this system. However, the co-axial inhibition also has drawbacks: Thus, the only eight teeth of the armature wheel require a further “dead” path for each engagement and, in addition, require a further gearwheel. But what remains is a markedly lower friction with at the same time a constant high level of accuracy, whereby the advantages of anchor inhibition and Chronometer inhibition can be combined. George Daniels dominated 32 of 34 horological disciplines and is one of the few watchmakers capable of making a watch from the beginning to the end without the help of others. He thus unified the Savoir Faire in a person that many watchmakers can not accommodate in their own four walls. In November 2012 a lot of Daniels “one-man-caliber” came under a hammer at a Sotheby’s auction in the memory of George Daniels. This included the Space Travelers’ Watch with 4-minute Tourbillon, Co-Axial Escapement andChronograph function, which was finally auctioned for 1,329,000 pounds, multiplying the originally estimated traffic value of approximately 150,000 – 250,000 pounds. For many, co-axial inhibition is the first fundamental innovation of the inhibition for over 200 years. However, whether co-axial inhibition will be successful in the long term is uncertain. The complicated construction is also associated with drawbacks and has proven to be less reliable in practice than originally assumed. In any case, George Daniels has enriched the watchmaking industry with an interesting innovation, thus providing a counterbalance in a watch world dominated by classic Swiss anchor controls. Many younger watch brands such as FP Journe and Greubel Forsey also see themselves as manufacturers in the tradition of George Daniels and are now inspiring with ebendieser mechanical aesthetics, which had once captivated the five-year-old George.